Mutinondo Wilderness is situated on 10,000 hectares of pristine Miombo Woodlands with thousands of different plant species and hundreds of bird species. The lodge has four chalets and one campsite room, of which the chalets have private bathrooms, balconies and tea and coffee facilities; and the campsite room share the ablutions with the campsite. The lodge also offers guests braai facilities, laundry amenities, a restaurant and parking on the premises. Mutinondo Wilderness is surrounded by crystal clear streams and waterfalls with water which is safe to drink and swim in. A great place to explore by foot or by bicycle. 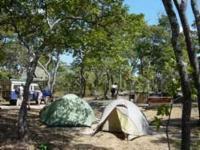 Mutinondo Wilderness is 73.7km from the centre of Mpika , the nearest airport 114.7km (Mfuwe International Airport). Hiking up Mayense Hill for this stunning view!